The Battle of Red Cliff occupies a similar place in Chinese folklore to the Arthurian legends in our own: a sprawling epic narrative with roots in historical fact, retold so many times that any resemblance to reality has been lost. Drawing on myriad sources – from ancient myths to modern archaeological studies – John Woo’s grandiose take on the material aims for the middle ground between action fantasy and gritty historical war epic. Buoyed by a string of military victories, power-hungry prime minister Cao Cao (Fengyi Zhang) sets his sights on the lush, fragile kingdom of Wu. 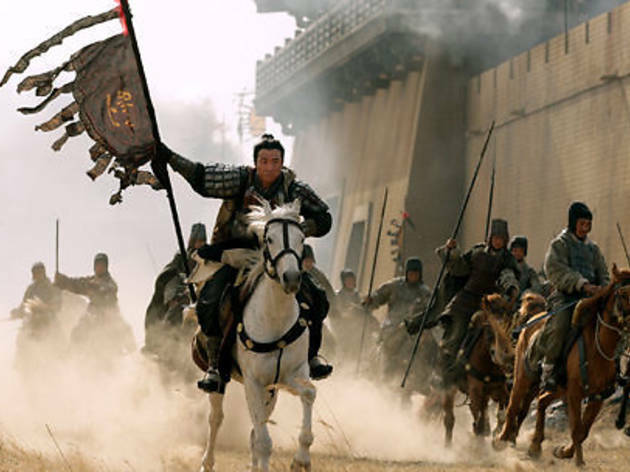 But he’s reckoned without the strategic brilliance of Zhou Yu (Tony Leung) and Zhuge Liang (Takeshi Kaneshiro), who lure Cao Cao’s army into the titular gorge, setting the stage for a desperate last-ditch battle. In Asia, ‘Red Cliff’ was released in two parts, totalling almost five hours. At half that length, this international cut ditches personal interplay and political intrigue in favour of battles and bloodshed. Not that Woo dumps character altogether: aided by a fine cast, he ensures that the central figures are distinct and memorable. But the film’s focus is on spectacle, and here Woo delivers, if not in quite the majestic fashion one might have anticipated. Grand set-pieces abound, from a stunning hilltop battle to the climactic fire-and-brimstone bloodbath, but there’s little we’ve not seen before. Nevertheless, as old-fashioned mythic entertainment, ‘Red Cliff’ succeeds in solid, sometimes magnificent fashion. Mr. Huddleston, I think you may have underestimated this movie. The thing is that in Asia, the movie was five hours long and was allowed to let everything develop more fully. The 2.5 hours allowed for the west I have to say does the movie not too much justice. 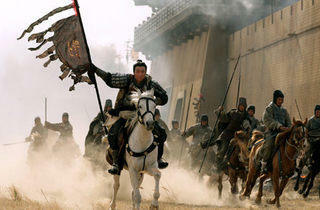 But with that said, this movie could be the one to revive the allure of the Asian epic for Westerners. visually dazzling and extremely well acted though the ending is rather a let down but it was rivetting to watch despite the subtitles and the mediocre finale . the earlier part evolves to a tremendous middle act where the marital tension ,royal intrigues ,rebellion and marauding armies provide immensely entertaining and emotionally stimulating sequences that are profoundly impressive and the spectacle is intelligent and logical too when compared to other similar efforts but john woo loses his nerve and settles for a spielberg style ending which is rather annoying but still it does raise some provoking queries about human freedom and struggle for justice in a grand period epic from the middle kingdom . What a fantastic film! it had everything-history of tactics used, excitemnet, dishy looking main characters, agreat storyline that kept you gripped, humour and a little bit of romance between a couple who are married--all three of us who went loved it. I will be buying this film when it comes out on dvd. Just commenting on the film: The film it's self is a great example of what tactics the army's of those days used to use, which was great to see, as well as the great leaders talking to each other about battle tactics and the older ways in which people "predicted" events such as the weather. overall this is a great film, gripping storylines with plenty of action. A very stylish film which you expect of John Woo. Enjoyed this film immensely, beautiful scenery and the scale of the fight scenes were quite amazing. Definitely worth going to see much just take a cushion as my behind was numb come the end!! In China, the movie's split into parts 1 and 2, with lots more scenes, compressing the movie into one is a bit too much. If they do a Blu-ray, then I would want the whole uncut version on it. I will stick to just giving my assessment of this film and ask others take their rants elsewhere as I just want to read about films and not net-flames. I enjoyed this film once I took it to give me a concatenation of illustrated examples of Sun Tzu's The Art Of War, the book getting a mention in the film. Given the size of the cast and armies of extras, some of the scenes and the effects appear too low budget, whereas other simpler ones worked really well. Reminiscent of Bodrov's Mongol, if you enjoyed that film, you will enjoy this one too. I hope we get the chance to see the full length version of Red Cliff one day as the Brits do have the attention span if others don't. One could critique this film for all sorts of reasons, but it is a wonderful story of military tactics and strategy in action, Sun Tzu style. I don't think meticulous understands how advertising operates on the internet. It attempts to be targeted and relevant, and often in an automated way. There's always a conspiracy theorist waiting to post! Boring.